Huawei's new flagship phone is the P9. 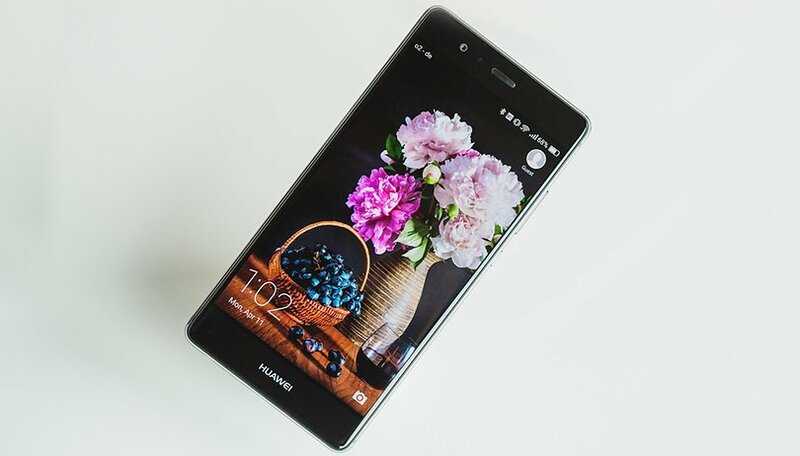 The fourth model in the P series, which began with the Ascend P6 in 2013, has a lot going for it in comparison to its direct predecessor, the Huawei P8. With the latest iteration comes more power, a Leica dual camera and a higher price which still hovers below competing devices. After thorough testing, we now have our complete Huawei P9 review. Read on for details on this ‘pocket Leica’ camera that has one strange quirk. The Huawei P9 will be available from mid-April. The price is £449 in the UK and 569 euros in Europe for the 32 GB variant with 3GB of RAM. It can be bought in the US for just under $300. There will only be the single SIM variant in Europe in gray and silver. The gold-colored version will be sold exclusively through Vodafone. For more memory and a bigger 5.5 inch display, you can get the 699 euro P9 Plus version, which will be around £600. The Huawei P9 is the same size as its predecessor, at 5.2 inches. It takes its place between the 5.1-inch Galaxy S7 and the 5.3-inch LG G5. It has an aluminum unibody, which gives the device a cool touch. The sandblast finish on the back avoids greasy fingerprints. The high-end finish has changed only modestly compared to the P8. The noticeable differences are found on the back. There are two smoothly integrated Leica cameras sitting in the housing above the fingerprint sensor. The collaboration with camera manufacturer Leica is shown in the form of a large logo on the right-hand side of this housing. With dimensions of 145 x 71 x 7 mm and a weight of 144g, the P9 is quite compact and light compared to most other Android smartphones. Thanks to the narrow bezels of the display the screen-to-body ratio is above average. Despite the phone’s thinness of less than 7 mm, Huawei managed to shoehorn a 3,000 mAh battery inside. Unfortunately this battery is not replaceable. Apart from the combined SIM and microSD slot housing, the Huawei P9 has no moving parts. The 5.2-inch display uses a Full HD LCD panel, providing reasonable contrast and good sharpness. The competition boasts higher resolutions, more contrast and saturation, and with brighter displays. In daylight, this IPS panel sometimes can’t shine through bright sunlight. The 1.7 millimeter-wide edges of the display have a soft feel to them thanks to the 2.5D design. The Huawei P9 doesn’t offer always-on functionality, such as we’ve seen in the Galaxy S7 or LG G5. The choice to not use OLED technology means that this isn’t as energy-efficient. But an OLED display is available with the Plus version. Huawei provides gesture control both with the fingerprint sensor and the display. The fingerprint sensor can be configured as a menu button. You can, for example, knock twice on the display with your knuckles to generate a screenshot. Huawei has make significant changes to Android. Notifications, the home screen settings menu and Quick Settings are structured differently. Under the hood are useful extras such as backup management, but also confounding features such as energy management. The latter restricts your accessibility to instant messengers, so you might miss some WhatsApp messages due to this. Huawei's UI is EMUI and the P9 comes with version 4.1, which is based on Android 6.0. The design, such as with the launcher, is heavily inspired by the iPhone’s iOS interface. An app launcher is not provided, meaning that all apps are displayed from and accessed on the home screen. Just as in iOS, you’ll need to create folders to keep your app collection tidy. The user interface can be changed with various design packages, which replace app icons, wallpaper and lock screen image. To download new themes, you’ll need to log in with a Huawei ID. I wasn’t always so impressed with Huawei’s software optimizations. Both power and memory are managed by non-changeable background services. Their functionality is well intentioned but can cause some issues, such as when receiving messages. I received several WhatsApp messages the day after they were sent and so missed important appointments. There is a way to exclude some apps from these restrictive measures. But this had no effect on WhatsApp, as I saw with the patchy transmission of texts. Software updates will fix this hopefully. The backup function works well. With this feature, you can backup and restore your apps and app data on another Huawei phone. The zip archive is password protected and stored on the SD card or on your PC. When you first boost up the P9 you’ll see that the phone is full of rubbish. It’s clear that these are pre-installed sponsored games and apps. Most can completely uninstall, but it remains a rest. These apps chew up a significant chunk of memory, so you’re left with around 21 GB from the full 32 GB of internal storage. Despite running Marshmallow, you can not format the microSD card to be used as internal memory. Therefore, you can only swap photos, music and a portion of your app data onto external storage. Huawei is one of the smartphone manufacturers trying to provide monthly security updates. This laudable commitment ensures greater security of your personal data. The revised HiSilicon Kirin 955 processor is largely the same as in the Huawei Mate 8. The P8 achieves comparable performance, which coincides approximately with that of the Galaxy S7. However, gaming performance does not reach that of the S7. LTE performance is above average in the Huawei P9. The connection is quick as lightning, reception is brilliant and at high speed while in a car. The signal jumps reliably from antenna to antenna. In the Huawei P9 there are two antennas that enable parallel Search and Smart Switching via quick changeover from transmission tower to transmission tower. The Huawei P9 supports a wide range of LTE frequencies in Europe. Vulnerabilities unfortunately affect just US carriers, meaning you might have to go without LTE in the United States. The Galaxy S7 or iPhone are therefore a better payoff in this regard. Storage space is big enough at 32 GB, plus you can expand it with a microSD card. The card can not be formatted to urn as internal memory, as Android Marshmallow allows for. Thus, you can only specify a target folder for pictures and videos and outsource some app data to the memory card. Audio from the bottom mono speaker performs well during hands-free calling. The included earphones provide good enough sound so that you can enjoy music. Sound from the ear speaker is balanced and allows for calls in noisy environments. The double Leica Camera is another strength of Huawei P9. My overall impression is positive, since the images were shot in automatic mode, yet I could develop a unique image character in manual mode. Like many other smartphone cameras, the Huawei P9 also offers quick launch functionality. Pressing the volume down button twice takes a picture immediately. Unfortunately, these instant pictures are often shaky. When the camera is running, the volume down button is always the shutter release trigger, even if its placement is not optimal. Both main cameras have 12 MP sensors with an aperture of f/2.2. The selfie camera has a resolution of 8 MP with a slightly smaller aperture to f/2.4. These ​​are not industry-leading specs, but, in practice, deliver better pictures than what you might expect of a smartphone. Both cameras come equipped with a ‘Leica Summarit H 1: 2.2/27 ASPH’. Summarit H is Leica's lens brand name for Huawei smartphones. The numbers 1:2.2 stand for the lens aperture, while 27 is the equivalent of the focal length of a full-frame camera in millimeters. ASPH denotes that it is an aspherical lens. The idea behind doubling-up on cameras is quite obvious. In a smartphone’s small body there is not enough space for the large sensors that are used in SLR cameras. So two sensors have been used in the P9 to make up for this, with the images both take combined via the software. The best parts of both images are combined to give an overall better image than what’s possible with only one lens. The lens setup of both cameras is identical. The sensor is Sony’s IMX286 with its 1:25 micrometre pixels used in both cameras. Compared to the competition, the sensors’ pixel sizes aren’t the largest. The Galaxy S7’s are 1.4 and Nexus 6P’s are 1.55 microns in size, respectively. However, one of the P9’s sensors shoots only in monochrome to measure the contrast of its subjects. The second sensor converts available light into RGB information with 16.7 million colors. Both sensors’ images are combined via software, so that, overall, 90 percent more information is provided per picture as in a photo shot with the Galaxy S7. This manifests itself in file sizes of more than 5 MB per photo. Most images can impress with breathtaking detail and dynamic range. But on closer inspection you may see blurring, as shown in the image below. In Professional Mode you can set ISO, white balance, shutter speed and other settings as you like. In addition, you shoot the images in RAW format. With JPEG compression you might notice some distortions and image quality loss. Below you can see an example of the distortions. The comparison image was taken with a Sony OX1. The battery life of the Huawei P9 is very good and suitable for heavy users. Even after several hours of play or photographing the battery lasts for a decent amount of time. It’ll last you for a full day before needing to be charged. Software optimizations for power saving are effective, however, they also inhibit background activity, such as with WhatsApp. This can lead to some messages arriving late. The 3000 mAh battery is non-removeable and charged via a Type-C connector. At least for the first couple of percentage points, charging is quite rapid. After 10 minutes of charging you’ll get five hours of standby time. Overall, the battery takes about three hours to charge until full. Without compatibility with Quick Charge 3.0 or other fast charging methods, it seems that a shortcoming could have been avoided. The Huawei P9 is a great smartphone for photography buffs, with image post-processing being some of the best you’ll find in any phone. Improvements are needed in the power-saving department but, since I have had good experiences with Huawei devices in terms of software optimization, I don’t see this as a deal breaker. The Huawei P9’s hardware is better than you'd expect for the price. The design and performance are very good. Only the software optimizations and mediocre display hurt my overall impression. But in the end, the positive aspects outweigh the negative, such as long battery life and camera quality. This makes the Huawei P9 a very competitive flagship and definitely worth your consideration. Has anyone else experienced that WhatsApp issue? Was it fixed by any update? Hi i buy it yesterday on teknistore . com and i pay 539€ more shipping by DHL. Wonderfull Huawei!! Great review about the pros and cons of p9 dual lense mobile. I m an N6P user but still I REALLY REALLY want the Leica lenses on my phone, and the sample photos seen so far are gorgeous, way better than current flagships. I haven't protected 'any' of the apps and I know for a fact that they get killed when the screen is off but I have 'never' ever missed a single notification from not only WhatsApp but also from any other app! I don't know what problem you have but it might be something wrong with your C2DM or a connection fault! I have a Huawei P8 myself... And since the time I've had it, I haven't had a single problem. Your problem of WhatsApp messages arriving late is probably a WhatsApp fault or a connection fault. The phone screen has diamond-cut edges rounded by curvatures. I prefer this over the Galaxy edge because i havent seen anyone using an Galaxy edge without a body glove cover....so the edge feel of the phone technically becomes non-existent. Nice specs & design. Bloatware is the issue as it unnecessarily occupy space. Early test pictures that I've taken show that the software needs refinement, but after a few updates it has a good chance of overtaking Iphone 6s. (Im not sure about S7). Same with Mate 8, after updates the camera improved greatly. Jessica, can you find out any info for me on the p9 max? There was mentions of it before the 'announcement', but nothing since... is Huawei going to release the p9 max or not? There won't be a P9 max, there will only be a P9 plus, which will feature a 5.5 inch display. Sorry. Huawei always puts this black bezels between screen and glass, it just looks ugly and is a big turndown for me! 1.7mm is tiny, barely notice it! That battery life thing is a bit misleading, once u download all your fav apps in the phone, then of course it will eat your ram from background and that consume battery and affect its battery performance. Highly doubtful for 1.15 days battery performance guarentee!